We had a great trip to this venue in 2016, with ascents of Carrock Fell, of Blencathra and of the Dodds ridge N of Helvellyn. 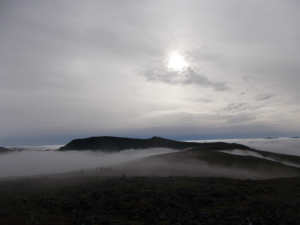 On the latter walk we had great temperature inversion conditions (see photo). Those who were there reckoned a return visit was a good idea so I’ve again booked the whole of the barn at St John’s in the Vale which sleeps 8. This is a good cosy barn with a log fire and hot showers. It’s effectively a stone tent so you need all the usual camping and cooking/stove gear minus the tent. The barn is located on a farm and gives direct access to the Helvellyn range plus other local walks, and there is more superb walking and climbing in easy reach e.g. in Borrowdale.